Samsung is all set to bring the Android 4.4.2 KitKat update to 5 of its Galaxy smartphones this month. We get this to know through a leaked internal Samsung India document. So, the five smartphones we are talking about are the Samsung Galaxy Mega 6.3, Galaxy Mega 5.8 Duos, Galaxy Note 3 Neo, Grand 2 Duos and Galaxy S4 mini. 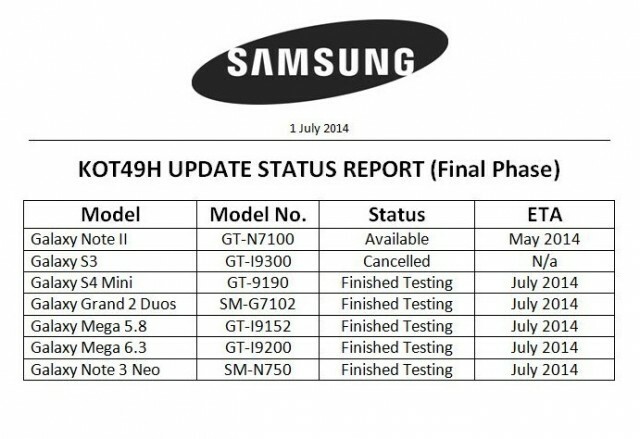 According to the leaked document, Samsung has finished testing the update for the aforementioned devices and rollout should start anytime this month. The Duos, that is Dual SIM versions of the Mega 5.8 and Grand 2 are listed to be getting the update but we’re not sure about when their single SIM variants will receive the update. However, we again get confirmation that the yesteryear flagship, the Samsung Galaxy S3 won’t be getting the update. It is important to note here that the update might reach these devices this month in India only and although the picture seems true but we’ll still suggest you to take it with a pinch of salt. You should also keep checking for updates on your devices and do let us know if you get it.